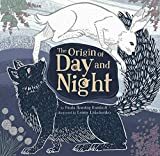 In this Inuit tale, the actions of a hare and a fox change the Arctic forever by creating day and night. In very early times, there was no night or day and words spoken by chance could become real. When a hare and a fox meet and express their longing for light and darkness, their words are too powerful to be denied. Passed orally from storyteller to storyteller for hundreds of years, this beautifully illustrated story weaves together elements of an origin story and a traditional animal tale, giving young readers a window into Inuit mythology. Paula Ikuutaq Rumbolt is from Baker Lake, Nunavut. She is currently attending Concordia University in Montreal. Growing up, formal education was strongly encouraged by her grandmother because she realized that this is the way to make it in the modern world. After high school, Paula attended Nunavut Sivuniksavut in Ottawa. There she learned much about Inuit history and culture. She realized how important it was to connect with her culture and began to learn as much as she could after her year in the program. She returned home for a year and learned how to sew, spoke to the elders in her community, and began to feel a very strong connection to her culture.Lenny Lishchenko is not a boy. She is an illustrator, graphic designer, and comic maker, who will never give up the chance to draw a good birch tree. Ukrainianborn and Canadian raised, she’s interested in telling stories that people remember years later, in the early mornings where everything is quiet and still. She’s worked with clients such as Lenny Letter, Power Athletics Ltd. Alberta Venture, and Rubicon Publishing, and is based out of Mississauga, Ontario.